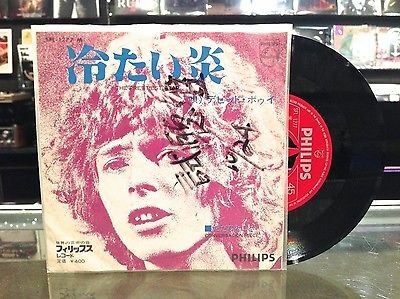 David Bowie "The Prettiest Star" MEGA RARE Japanese PROMO 7"
Record retains it's original bright shine throughout but does have a handful of surface marks only visible in bright light. Plays GREAT! Cover is a 2 sided picture sheet inside a Japanese rice paper sleeve with Japanese handwriting on the front (of the rice paper sleeve, not the actual insert). Insert has a couple minor creases. This record is already one of theHOLY GRAILSfor David Bowie collectors as a regular Japanese release and this is the PROMO Edition of the holy grail. I've searched high and low and I have seenNOinstances of the Promo Edition selling online, ever.If you see an old listing where this has sold please let me know!The regular edition sells for around$5,000and I've only seen it come up twice in my research, and again, twice for the regular edition. The Wikipedia page for The Prettiest Star claims the single sold only 800 copies. I'm not sure if that's worldwide or for a certain region but it speaks to the rarity of any copy of the single. If you Google search "Prettiest Star Japan" you can see one David Bowie discography site that has pictures of this record and certain pressing information, but again, no info on any online sales. All combined orders go out by calculated weight with a $1 per item fee to cover expenses. I'll cut you a break on the $1 fee if you buy a ridiculous amount of records but I'll have to do that on a case by case basis. It really just depends on how many you buy and how expensive your order is. If there's any question about a combined order just send me a message and I'll be happy to help. I will leave you feedbackonlyafter you leave feedback for me. I do this to protect myself from negligent buyers. Please don't beg for feedback. Sometimes I may take a while to hand out feedback but I will always give it out. Endless messages begging for feedback only makes me not want to give you any.